The Spanish Military Hospital is considered to be the haunted hospital of St. Augustine. You can locate this hospital, which was originally named “Our Lady of Guadalupe”, in the village of the Spanish Quarter in the Nation’s Oldest City. The building that you will discover is not the actual hospital that stood from the late 1700’s to the year of 1821, but an exact replica. In the year of 1821, the City of St. Augustine had to replace several water lines that were actually under the hospital, so they decided to remove the original building and rebuild. Here, you will learn of the spooky tales that surround The Spanish Military Hospital in this ancient city. If you are interested in experiencing a haunted hospital firsthand while in Florida, this is the place to go! By the time that the city started tearing down the old walls of this particular hospital in an effort to revamp the water lines that carried water to several businesses and residences, many patients and employees of this haunted hospital had been documented in stating that something “evil” and “frightening” seemed to roam the ward. This evil presence seemed to hang in the air like a dense dog, often frightening patients and running off specialists that were hired to treat the sick and the dying. While it was often believed that perhaps the lingering air of death in the ward may have been accountable for these feelings, the city quickly discovered the possible culprit. Once the walls had been removed, and the ground was turned for the new water lines, thousands upon thousands of bones were discovered! The North Florida Paranormal Research group has established that the bones that were uncovered seem to be in a type of burial ground. It is believed that the burial ground belonged to the Timucuan people. The Timucuan people are a group of Indians that were native to the area of St. Augustine in the earliest years of history. This was quite a remarkable discovery. However, in the year of 1934, a group of people were working at the area near the ever-popular “Fountain of Youth” in St. Augustine, preparing the turning of the ground for an orange tree crop, and another burial ground that was uncovered that seemed to also be Timucuan Indian based. It is believed that the “evil” and “frightening” presence that lurked in the original Spanish Military Hospital were the many souls that had been buried underneath the original structure. Despite the fact that the new structure has been built, hauntings from the earliest days of St. Augustine still seem to occur. There are several rooms in the new structure. You have the “Mourning Room”, where patients were moved prior to passing on to the other side. It is here that a priest would come into the hospital and “bless” the dying. A number of hauntings have been said to occur here, though all seem to be residual. This means that they are more, or less, recordings of events that took place in this area. None of the hauntings seem to interact with the living. In many cases, there are sounds of cries and screams in this room, and even conversations that seem to be relatively distant. 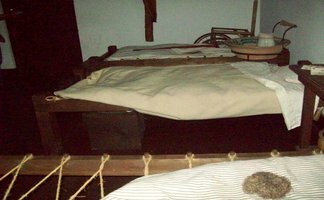 Many have claimed that when they visited this room in the haunted hospital, that there was an imprint on the bed, that looked as though someone were laying on it, but no one was there. 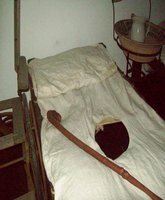 The “Ward” of the Spanish Military Hospital in St. Augustine, Florida is another hot spot for paranormal activity. This is where the sick and the dying were kept until they were moved to the Mourning Room. Seeing that there were many wars throughout the time in which this haunted hospital operated, it is often a room where many were in severe pain, and there were people who were very sick as well. It has been documented that sounds have been heard in this area, objects have been moved, and misty apparitions have been seen here. There are ghost tours offered in St. Augustine that will allow you to take a stroll through this haunted hospital. Simply contact: Call 904-827-0807 for additional information.